Le Grazie II apartment in Florence has a strategic position to move around in the historic center and visit all the wonderful attractions in the city. Tastefully furnished, traditional design with cotto floor and wooden beams, the apartment is on two floors: dowstairs you find a spacious living/dining room with sofa beds and a kitchenette; upstairs you have a bright double bedroom and a bathroom with shower. A 18.00% of total price is charged on your credit card for all reservations. The apartment Le Grazie 2 is located in Santa Croce area. Le Grazie II apartment Florence is located in Santa Croce area. The neighborhood reflects perfectly the soul of Florence, full of tradition and history, with photographs that reflect the intact memories of ancient magic; it’s at the same time one of the most touristic areas in the city, always crowded, during the day tourists queue to admire works of art and nighttime young people from all over the world enjoying what the city has to offer. 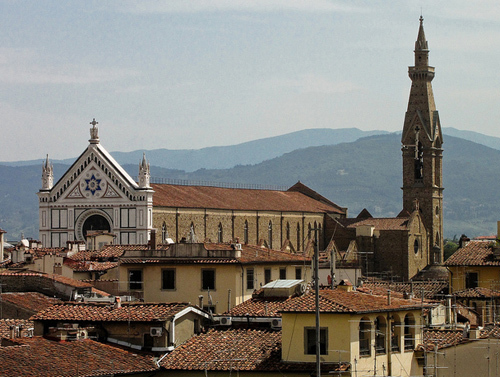 Santa Croce, in fact, is one of the nightlife main points in Florence: clubs, discos and bards converge in this special place. There’s something for everyone! And nothing better than to find an apartment in Santa Croce Florence, from where you can have easy access to the different areas of the city. Uffizi Gallery - 0.24 km. Santa Croce Square - 0.27 km. Ponte Vecchio - 0.48 km. Charming apartment in Florence located in the very center of the city: it offers a double bedroom on the upper floor and a charming livingroom with wooden beams and comfortable sofas. All the amenities included. Can host up to 4 people.